Subscribe to Airspeed through iTunes or your favorite other podcatcher or listen by clicking here: http://traffic.libsyn.com/airspeed/AirspeedKoltes.mp3. 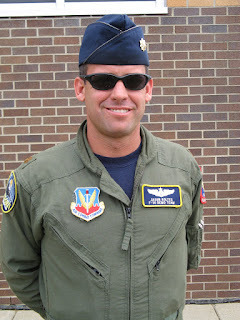 We ran into Maj Jason Koltes, USAF, on the ramp at Battle Creek and managed to buttonhole him for a few minutes to talk about the F-16 and what it’s like to train and fly in the workhorse of the US fighter arsenal. See more about the Viper East F-16 Demo team at http://www.shaw.af.mil/library/vipereast/index.asp. More about the Air Force in Airspeed’s sidebar or at http://www.airforce.com/. Many thanks, USAF, Viper East Demo Team, and Maj Koltes for tearing up the skies here at Battle Creek!